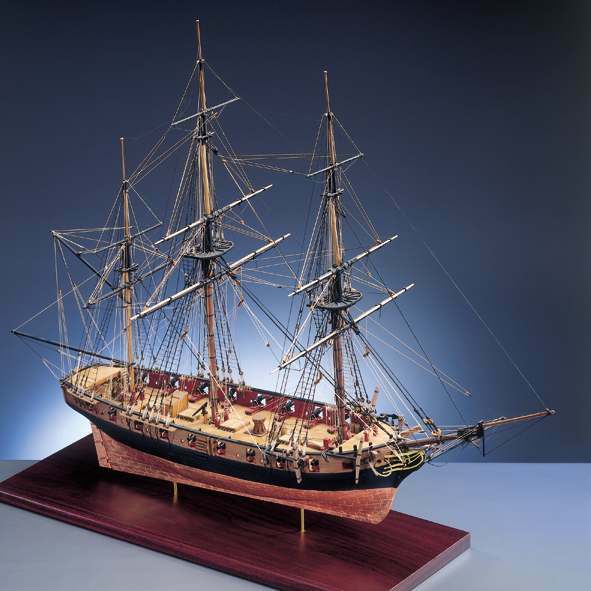 Jotika 9002 Nelson’s Navy HMS Snake 1/64 scale wood ship kit! 18 cast carronade; double plank on bulkhead hull; walnut CNC parts; 900 copper plates; black and natural hemp for rigging; full size plans and comprehensive instruction book. The Snake kit has been designed with the novice / intermediate builder in mind and is ideal as a first or second model for the introduction to plank on frame building. The Snake class were ship rigged sloops. This class was very business like with a flush deck and nine cannons or carronades each side, they were very fast and seaworthy. As originally built Snake had a full ordinance of 32 pounder carronades. Carronades replaced the carriage guns because at close quarters the short range carronades proved devastating to their opponents. Class dimensions were: length 100’; breadth 30’6”; displacement 382 tons with a crew of 121.